Hello my friends!! 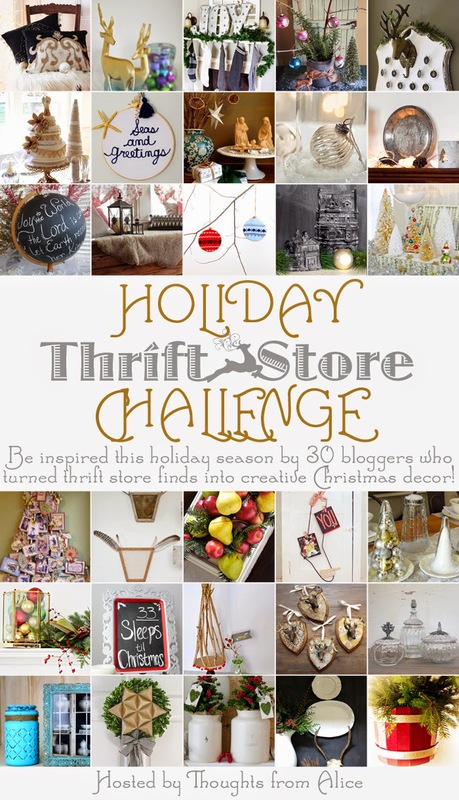 I am so excited you are here today because I have teamed up with some of my favorite bloggers for a Holiday Thrift Store blog hop! Our challenge was to find an item at a thrift store under $25 and repurpose it to decorate for the holidays and hopefully inspire you to do the same!!! A big thanks goes out to my sweet friend Alice from Thoughts from Alice for bringing us all together to share these amazing holiday projects!! I decided to use two ordinary vintage tennis racket presses that I pass by at thrift stores ALL.THE.TIME for my rustic, woodsy theme I'm going with this year for Christmas. I see these everywhere and they are always very inexpensive and they have the best wood patina!! With the larger of the two, I traced the shape of the press on a grain sack I already had, cut it out and used hot glue in each corner on the inside of the press to secure the sack to the frame. I also glued on turkey feathers to use as "antlers". I reassembled the press and tightened the screws. With the small press I used faux fur I purchased from Joann's. Like the first one, I traced the fur using the shape of the frame as my guide, cut it out and glued it in place. This press did not come apart like the other one, but I was still able to get some glue on each corner to keep the fur in place. I used sticks as antlers for this one. Again, I tightened the screws as much as I could to clamp down on the sticks and hold them in place. It took me about 15 minutes each to put together the tennis racket press deer! So easy! Between the two presses and the fur from Joann's, my total for this project was around $15!! Now, you must go and visit the rest of these fabulous ladies! I know you will be blown away by all the talent!! so great idea! i love it! This is so creative! I never would have looked at these and thought to turn them into these adorable wall hangings! Great job! Oh my goodness, how clever! I love this idea!! Sesriously. You are a genius my friend. I love coming here to be inspired by your crazy talent! Thanks for taking the challenge with me! What an idea! I hope the magazines see this. It certainly is a one of a kind project that took a very creative mind to come up with! These ate way too fun!! I am in love! Oh how fun are these! I love them! CUTE!!! Such a clever idea! these are AWESOME! what a great and unique idea!!!! LOVE! Oh my goodness, how stinkin cute are these! So so clever, just love them! These are just making me smile. Would never have thought of this. So creative and fun! Love the rustic art. I have few covers in the garage. Love this modern, rustic style. So clever! I also love all the natural materials. These are adorable! I have a few tennis racquets buried in my garage - I must go dig them out!